Taking a moto taxi is probably the most dangerous thing you can do in Kigali. It’s also probably the most convenient (and fun) thing, too, which makes taking motos a difficult thing to give up. Knowing that motos are dangerous but popular way to get around town, Nash and Peter co-founded SafeMotos in an effort to make getting around town safer. The following interview will give you the scoop on SafeMotos. Also be sure to check out their Facebook page for more info. Tell us a bit about yourself and the SafeMotos team. SafeMotos is a team that showcases the future of ICT businesses in Rwanda. SafeMotos was cofounded by Nash, a Canadian entrepreneur with almost ten years experience on the continent and Peter, a Kenyan who is easily one of the best programmers in Rwanda. They combine their global skill set with Rwandans Clive and Eric, who have been taught to push their creative boundaries by Kigali’s innovative Kepler University. Together, the SafeMotos team brings a Silicon Valley startup mindset with a local twist. SafeMotos is an application for smart phones that lets a user order a safe motorcycle taxi to exactly where they are standing at the touch of a button. It is convenient, letting you order a moto right to your gate. More importantly, SafeMotos only connects their customers to drivers they know are safer. They do this by equipping vetted moto drivers with affordable smart phones which have sensors in them that can detect how the driver drives. They can see if the driver is always accelerating like an airplane or breaking like they are about to hit a wall then only connect customers to the safest drivers in their system. What problem are you trying to solve with this product? Right now, as a motorist in Kigali, you are 263 times more likely to be killed in a traffic accident than in the United States. 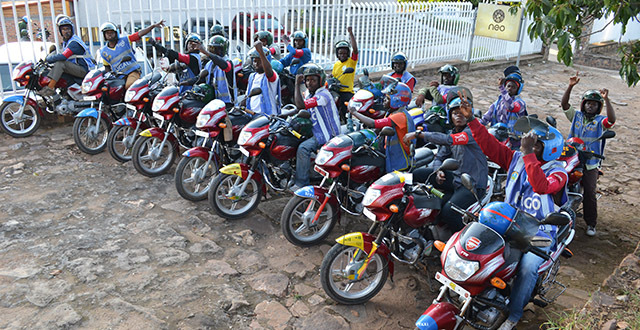 The Kigali City Council states that 80% of traffic accidents in Kigali involve motorcycle taxis. Every time you take a moto you are putting your life at risk, yet, most people just go to the road and gamble with their lives by taking the first moto they see, having no idea if it is a 14 year old driver on his first day or a professional. SafeMotos takes the gamble out of taking a moto. It is very easy to use SafeMotos. You open the application, select on a Google Maps style interface where you want to be picked up from, write one line of text clarifying your location then the driver comes and picks you up. There is a suggested price at the end of the trip based on distance travelled and the option to rank the driver, which SafeMotos uses to corroborate their data model. Who is your prime target market? SafeMotos is priced right now using data generated from a Carnegie Mellon University in Rwanda research project that is the most accurate price estimation tool available for motos. They aren’t charging anything extra since they believe that safety isn’t something that only the elite should experience. Better yet, their business model which takes a commission from drivers for getting them more traffic lets this business model be sustainable. SafeMotos is for anyone in Rwanda with an Android smartphone who would like to get where they want to go in one piece. Easily the biggest challenge for the SafeMotos team has been fighting with moto rider’s complacency: many people believe that dying from a moto accident is just bad luck and can’t be avoided. Imagine people saying the same thing about cancer or malaria even though traffic deaths kill more than either in Kigali? Another challenge is asking customers to order a moto a few minutes before pick up, perhaps while you are brushing your teeth in the morning or starting to pack up at the office, so that the driver has time to arrive. Where did you get the idea for SafeMotos? The idea of SafeMotos came when Nash’s mother came to visit Rwanda and he wouldn’t let her take a moto, even though he uses them every day. His argument that he couldn’t tell a safe driver from a dangerous driver fell on deaf ears and Nash began thinking maybe she is right, after all, when you are on the back of a dangerous driver’s moto you know almost immediately whether the driver is good or bad and there must be a way to measure this. What sort of feedback have you gotten so far from customers? What are the requirements for moto drivers to participate? Every SafeMotos driver is deeply vetted before being put on the live SafeMotos system. They need to have 3 years experience, all their proper documentation, answer a series of interview questions, drive on SafeMotos’ testing platform until they have a meaningful amount of data on their driving habits and take trips from SafeMotos team members before being connected to a SafeMotos driver. While they are a driver, they must stay above 90% within the SafeMotos system to be connected to customers. How have moto drivers reacted to this new service? SafeMotos’ 25 current moto drivers have been passionate and excited by the SafeMotos project. With more and more motos prowling the streets of Kigali it has become a competitive dog eat dog game for finding business in Kigali. With SafeMotos, experienced drivers have a new channel for finding customers. What is the future for SafeMotos? The SafeMotos team decided to launch in Kigali for its exceptional support for innovative startups. However, SafeMotos CEO Nash states that ‘If we only stay in Kigali we will consider this project a failure. The issue of motorcycle taxis and safety is a continent wide issue that SafeMotos is uniquely addressing: only when anyone who takes a motorcycle taxi can feel that they are not gambling with their life will we feel like we have achieved our goal.’ With more than 1 million motorcycle taxis across Africa performing 15 million trips per day, it looks like the SafeMotos team is only taking their very first step here in Kigali.